This week continues a spy story set in late Georgian England, the year before Trafalgar. Last time Sally and her fiance met a strangely assertive maid in the Avonside garden (which I should call the parade). The maid didn’t leave, and she had good reasons not to. “A spy, how exciting; isn’t it exciting Robert?” Sally’s eyes glowed at the idea. Still working on a cover idea – hard even though I’m a dashed good photographer (if I say so myself). The militia (Shown here in Gilray’s cartoon “repel all invaders”) will soon make an appearance. Great Britain is on a war-footing with that Corsican monster just miles away over the channel. Mind you the monster would have said kilometres, and his ‘Million man’ army was significantly smaller than a million soldiers (about 100,000 strong). Whatever Napoleon was, and he was many things (mostly bad), he was a master of publicity. Nearly all the men in England were enrolled in their local militias – but the militias were not anywhere as well organized or skilled as the regulars. Jane Austen’s villain Mr Wickham would have fit right in with them. How he would fare when promoted to the regulars was another question. Gilray’s cartoon shows typical upper class condescension (in the modern meaning) about the rest of the country. The sorry-looking militia men are all tradesmen (a cobbler, a mason, a painter (Gilray himself? ), a tailor, a barber), and they’re led by a baker. As always, I love your pictures. The dialogue is great. I know we’re all constrained by the length of our snippets. I hope in your finished ms you add reactions and other descriptions to the dialogue. I struggle with the balance between dialog and description. Thank you. I made some changes. These sound like interesting characters in a rather interesting situation, if Alice has just revealed she’s a spy. But it was a bit hard to follow because I wasn’t always sure who was speaking. I agree with Diane, you should add reactions, descriptions, and names, like you did at the end. Good luck with this piece! The Georgian period is one of my favorites. Somehow I wasn’t surprised the maid was actually Alice, which is no criticism! Enjoyed the scene – her friends are pretty clueless, but I guess it’s part of the “invisibility” of the servants in that era. Enjoyed the vintage illustrations and further details. Thank you. It shouldn’t be a surprise – given that it was part of her training (though that was many weeks ago). The more I study Gilray’s cartoon the more little details I find. 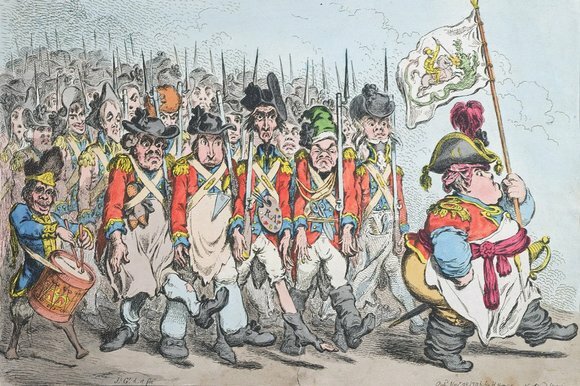 The painter has his brown-bess on the wrong shoulder. I don’t know if you’ve ever seen Giles cartoons (UK 1930’s – 1980’s or 1990’s) but they had the same level of slightly off the wall detail. Interesting. Found the punctuation made it a bit difficult, but creativity is good! Nearly every semicolon should be a period, but then it would be a d*mn d*mn (following Twain’s advice about very) short snippet. Thank you. Oh I bet the Mr. Mapleton character is a real pip! Being a historian, I liked the bit of addd history you gave after the snippet too. As always, I enjoy your historical commentary as much as your snippets. They help bring everything to life. Previous Previous post: Sunday Snippet, Dinner is Served.